Award winning Nigerian singer, Ayo Balogun, popularly knows as Wizkid, is emitting major daddy love as he shares the first photo of his second son. 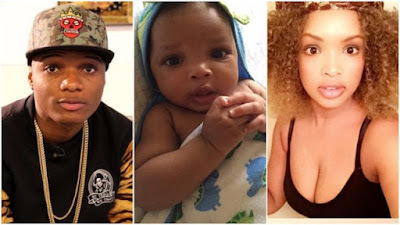 Recall, Wizkid has never for once acknowledged King Ayo, even in 2016, His second Babymama, a Guinean Model, Binta Diallo accused the singer of being a dead beat dad. She even went as far as posting a the results of a DNA test which proved Wizkid was the father. But now, he’s confirmed that he’s indeed the father of 3 boys, Boluwatife, King Ayo and Zion! The singer shares the photo below on his Snapchat, with Love Emojis!